All of the images were actually drawn on canvas and pictures were taken in order to create the texture data. 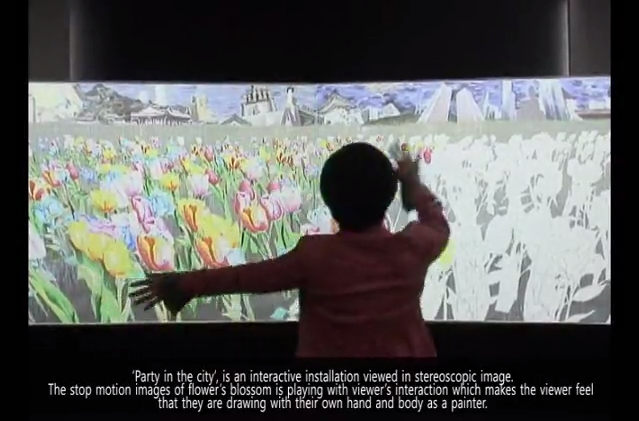 The animated effect was created by applying the time-lapse progressions of the paintings creation which is displayed in sections as the user walks past the display. THis is done using the Kinect which recognizes the movement of the audience and then apply's the effect of the painting coming to life. The Images are placed in 3D space and the movement of flowers and fireworks are programmed in C++ with OpenGL. A Kinect is used for recognition of audience's position and movement in dark showroom. Therefore, there is no limit of participants in the interaction.